For some people the ideal holiday requires nothing more than a poolside room, a comfortable chair, and a good book. Others, however, prefer to take a more active approach to vacationing. Families are increasingly choosing to plan fitness holidays, or at least trips where activity and physical exertion are part of the fun. 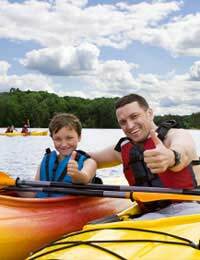 Camping holidays are popular with families for a variety of reasons. Typically, they are more affordable than other types of trips, which can be an important consideration for growing families. Also, most children have a natural love and appreciation of the outdoors, making camping a family favourite. Finally, while some holiday options offer activities that appeal only to certain age groups, camping and the activities typical to camping trips are pleasurable for people of all ages. The opportunities for healthy exercise are abundant on camping holidays. Raising a tent, gathering firewood, and nature hikes are not only fun, but healthy as well! An increasing number of families are using their holidays to benefit others by volunteering their time for a cause that they find meaningful. These types of trips are usually active in nature, so they are beneficial to participants in many ways. Whether planting trees or helping to build houses for underprivileged families, people who spend their vacation time helping others get much more than a good physical workout. Parents can help their children to understand the importance of reaching out to others in need, possibly sparking a continued interest in community service. There are lots of organisatons that are always happy to help willing participants find just the right volunteer opportunity. At the end of such a life-changing holiday, families are sure to go away with far more than a great tan and a pile of photographs. Staying active on holiday doesn't require traveling to faraway places. Many people find that while they have spent many vacations exploring other countries, they've never really been a tourist in their own backyards. Planning a series of day trips exploring the museums, parks, and historical sites near home can be a wonderful, active holiday. City dwellers may want to head out into the countryside for hiking and biking fun, while those who live in rural areas can enjoy walking tours of the cultural offerings of the city. In either case, just getting away and spending time together as a family, especially when an emphasis is placed on activity, is sure to make the trip a healthy and happy one.